On 26 August 2012, the Negev Coexistence Forum (NCF) sent a letter to mayor of Be’er Sheva, Ruvik Danilovich, urging him to intervene and relocate the “Wine Festival” set to take place from September 5-6 on the sacred grounds of the city’s historical Big Mosque. NCF also sent letters to Israeli President Shimon Peres and Prime Minister Benjamin Netanyahu. Holding the wine festival right next to the mosque, the NCF Secretariat argued, is a display of “dishonor toward the place and its believers,” who continue to be denied the right to use the mosque for prayer. “In the whole city, there is no mosque which can respond to the needs of the thousands of Muslims who come to the city each day and support its economy,” the NCF letter read. In a written response to NCF, Be’er Sheva mayor Ruvik Danilovich said that the festival is taking place next to the Negev Museum, not on the grounds of the mosque. The festival, therefore, “has nothing to do with offending the holiness of the place, its character or Muslims’ feelings,” Danilovich wrote. 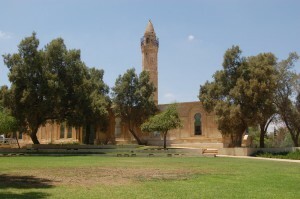 The Big Mosque was built in 1906 for the use of the Muslim residents of Be’er Sheva and the entire Naqab-Negev population. It was used as a place for worship until the State of Israel was created in 1948. Until 1953, it used as a court and prison; the structure was then used as a museum until 1991, when its contents were finally emptied and the mosque was closed by the state. A recent Israeli High Court decision stated that the mosque should now be used as a museum of Islamic history and culture. Contrary to mayor Danilovich’s claim, both the Negev museum and the mosque are within the same fenced-in yard, which is no larger than two dunams (2,000 square meters). This means that the festival will indeed take place on sacred grounds of the mosque, when the area should, by law, be used as a museum of Islamic history and culture. Ultimately, NCF urges the Be’er Sheva municipality to change its current stance and move the “Wine Festival” from its current location to another place in Be’er Sheva. Holding the festival on the grounds of the mosque is not only disrespectful towards the city’s Muslim residents, but has the potential of igniting underlying tensions between Jewish and Arab-Bedouin citizens of the entire Negev area. NCF calls on the Be’er Sheva municipality to ensure that Be’er Sheva remains a peaceful place that is shared equally by both its Jewish and Arab-Bedouin residents, and wherein both communities are treated with respect and dignity.